This 2 fl oz Blue glass Boston Round bottle and glass Childproof dropper will work well for aromatherapy, essential oils. Protect you precious products using this bottle with glass dropper. I use mine for Beard oil to protect the oils from the sunlight. We have used them with 8oz, 16oz, 22oz and 26oz jars (see picture). Fits Most 8oz, 16oz, 22oz and 26oz Apothecary Jars. 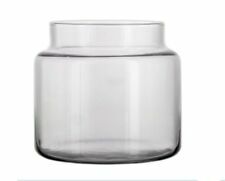 These high quality, clear, glass, round jars are perfect for use with lotions, creams, and scrubs. Inner liners create a tight seal. Perfect for travel, and conveniently fits in your purse. Inner liners create a tight seal. Perfect for travel, and conveniently in your purse. WeDO NOT ACCEPT P.O. BOXES. WePROMISE we can you happy if you give us a fair chance. we are here to help. These high quality, clear, glass, round jars are perfect for use with lotions, creams, and scrubs. 1000% A . So check back often and see all of our new products and great deals. EXCELLENT PRICE. These high quality, clear, glass, round jars are perfect for use with lotions, creams, and scrubs. Inner liners create a tight seal. Perfect for travel, and conveniently fits in your purse. We do not accept P.O. Boxes.